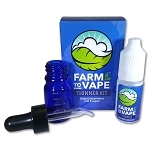 We get asked often on what is the best sub-ohm tank to use with Farm to Vape when using a concentrate such as wax or shatter. We have put several head to head against each other to determine the best one. We are judging on leaking, coil flooding (popping), taste and cloud production. What is a THC Vape Juice Cartridge? Prefilled or fill your own THC vape juice cartridges (carts) have become very popular in legal marijuana states with large year over year sales increases. Thc vape juice carts are really easy and inexpensive to make yourself even though they sell for a lot of money depending on what is going into them and how they taste.